The Chinese film industry doesn't produce stars so much as legends. Jackie Chan, Bruce Lee, Chow Yun-Fat, Gong Li, Sammo Hung—they may once have been ordinary mortals hailing from Taiwan, Hong-Kong and elsewhere, but when they started appearing in and creating blockbusters, they left our atmosphere, riding on the raw power of otherworldly charisma and imagination that most of us could only dream of possessing. When these titans come together, it's always an event. So when Vietnamese-born director Tsui Hark finally teamed up with Stephen Chow, the mad cinematic scientist who gave the world live-action "Looney Tunes" like "Shaolin Soccer" and "Kung-Fu Hustle," it was bound to be an event. Their collaboration, "Journey To The West: The Demons Strike Back," is a fittingly gargantuan affair, huge enough to fit the ambitions of both auteurs. Chow, the director and writer of series curtain raiser "Journey To The West: Conquering The Demons," wrote and produced this sequel and ceded the director's chair to Tsui, the man who's been sweetly infecting the daydreams of Chinese audiences for 40 years. The result is both a madcap success on its own bizarre terms and an informative distillation of each auteur's sensibility. When last we left monk Tang (Kris Wu), he had chosen to team up with three vanquished demons to do something productive with his grief over the death of his secret beloved Miss Duan (Shu Qi). 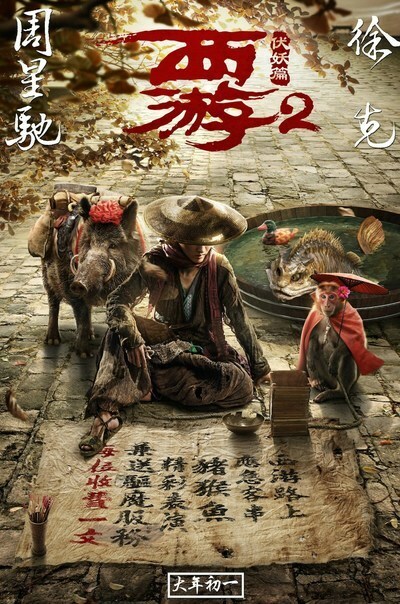 It's been a while since they joined forces and the dynamic between Tang the Monkey King (Kenny Lin), Pigsy the horny hog demon (Yang Yiwei), and Sandy the fish demon (Mengke Bateer) has grown strained. The Monkey King has little but contempt for his captor/master, and, when we join them, they're attempting to raise a little money by putting on a sideshow at a carnival (the ADR and the elaborate set bring Fellini to mind). Monkey resents being used as an attraction and deliberately sabotages the performance, but his displays of inhuman strength still dazzle the circus crowd enough that Tang and his crew are allowed to continue unharmed on their way west. Tang's mission in life is to tame demons and come closer to a Buddhist ideal, and his three traveling companions are ultimately his way to enlightenment. He has to learn how to best take care of and manage these rampaging monsters of id and misaligned humors. Monkey's disrespect for Tang is just one more way for the monk to come to terms with his personal failures, but it takes him a while to figure out that the Buddha doesn't just hand out burdens idly. The four wayward souls encounter several challenges (including a house full of spider women, a petulant king and a tricky minister's temptations) that serve as lessons in cooperation, selflessness and trust. From an opening dream sequence that references "The Three Worlds of Gulliver," it's clear how well Chow and Tsui understand each other. Chow's more fluid storytelling is occasionally missed in "Journey To The West: The Demons Strike Back," but Tsui, who directs like Bill Bruford plays drums, takes stylistic leaps that not even Chow would have dared. The world is a playground and a canvas upon which to finger paint for Tsui. His demons rampage through one gorgeously colorful digital tableau after another, passing otherworldly skies, dizzying parades of set design, and gorgeously icky special effects every few seconds. It's all escalation all the time, finishing with three mountainous false Buddhas rising from the sea to combat the Monkey King, transformed into a rock monster. Tsui rightly sees nothing as an obstacle to his creativity, and the film feels appropriately monumental and boundless. It's also very funny to see Tsui taking to the deliberately cartoony sensibility of Chow's writing, as when characters pummel and kick each other so fast their hands turn into digital clouds, or when arms stretch like rubber bands during combat. Chow integrated this with more sly humor and emotion in the first "Journey To The West," but Tsui's clamorous direction makes these flourishes feel like magic tricks, emerging from nowhere and vanishing just as quickly. What "Journey To The West: Demons Strike Back" misses and can't make up for is a woman's touch. Shu Qi makes a few welcome appearances in dreams and flashbacks, but they last seconds at most. Tsui doesn't give Yao Chen as The Minister nor Jelly Lin as Felicity, Tang's fleeting love interest, enough time on screen for their personalities to develop beyond "agreeably crazy" and "beautiful, sad and submissive." Shu Qi's forceful and charming Miss Duan rose above the ludicrous dictates of the character, namely that she found Tang so desirable as a mate that she'd fake murders and kidnappings to be near him. Chen and Lin can't do much with their characters and Tsui doesn't leave his camera on them for more than a few seconds per cut, which cuts down on the opportunities to do the kind of ingratiating work Shu did in the first film. Chow lingers longer on his performers as a general rule. Tsui has skies and monsters to conjure; he doesn't have time for development that isn't broad and easy to follow. Which may explain why those three female performances, undercut as they are, are the most appealing in the film. The rest of the cast is caught up flailing for the sake of physical comedy bits that are destined to fail, as Chow's humor is mostly stymied by Tsui's heavier presence behind the camera. This isn't an issue when there are demons on screen, as he's one of the greatest conductors of on-screen chaos alive (just look at his previous feature, "The Taking of Tiger Mountain," a non-stop delight, if you don't have time to track down his whole joyous oeuvre). The repeated attempts to tell Chow's jokes (like the repeated duplicated motion spell from the first movie) in incongruous grammar result in many a joyless pratfall. Nitpicking aside, moviegoers owe it to themselves to check this movie out. It's got more imagination in one nimble limb than a "Fast & Furious" sequel or a "Star Wars" prequel can lay claim to in their whole battered chassis. When the score kicks in and the combatants take to the heavens to wage inventive battle, "Journey To The West: The Demons Strike Back" truly soars. It's a worthy fusion of two of the film world's most brilliant stars.